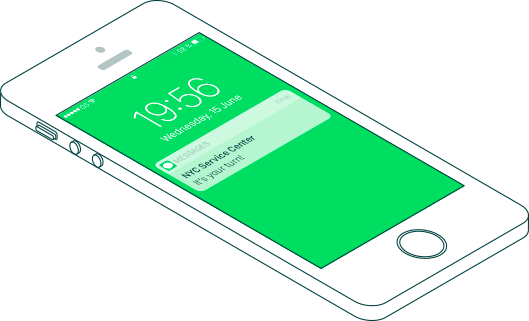 Inform your visitors with automated and customized text messaging. Qminder can send customized automatic messages to your visitors when they are added to the queue, or when they are being called. Text messaging is only available for Pro Plan subscribers. 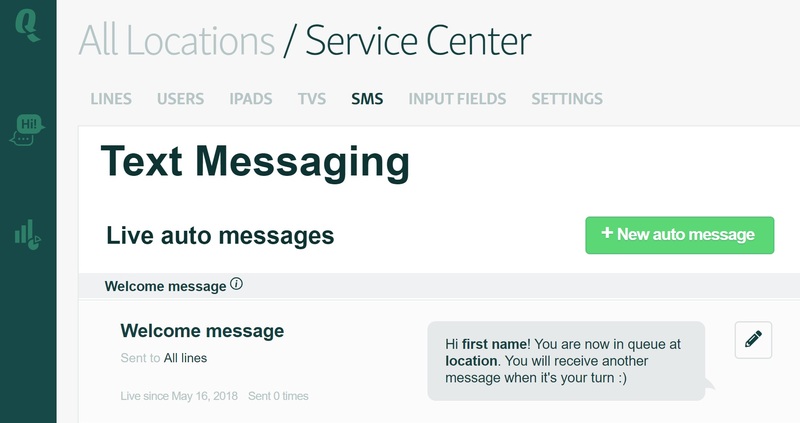 You can enable messaging by going to the Locations tab and clicking on the location's name if wish to set up SMS. On the next page choose SMS and then click the "Enable messaging" button. This turns on both automatic messages and SMS chat. Let the clerk insert the phone number with the phone number input field. Let the visitor type their phone number in through the self-service iPad. 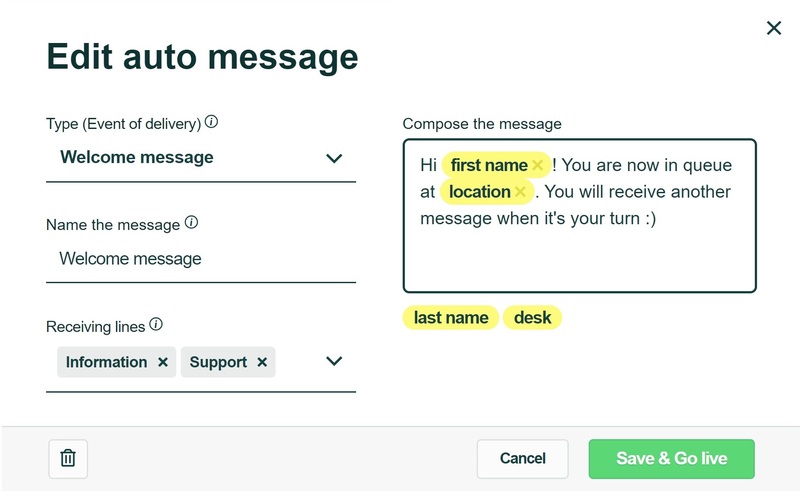 You can create a new message by clicking on + New auto message button. You can edit existing auto messages by clicking the pencil icon on the right side of the message. You can customize the type, name and line of each auto message. Each line can have a unique specialized message. The welcome message is sent when a visitor has been added to the queue. This gives the visitor peace of mind. When the visitor is being called by your agents, they will automatically receive a message that informs it's their turn. This grabs the visitor's attention. If the calling clerk has selected a desk, then the visitor will receive a message that informs it's their turn and which desk to come to. This feature also works with named desks. After a visitor has been served, you ask them for feedback or remind them to come back next time. You can set the time of delivery to be either Immediately or 24 hours after the service. Read more about the use of post-service SMS here! NB! One type of message per line; e.g. it's not possible to have two welcome messages for the same line. You can change the content of the message in the text field box. Make sure to save your changes by pressing the Save & Go live button! The words highlighted in yellow are placeholders which change value accordingly to actual information. To add a placeholder, click on the yellow buttons below the text box. To delete the placeholder, simply click the on the X next to the placeholder. SMS notification is a convenient and modern way of greeting and notifying visitors. You can send a welcoming message that lets the visitor know they're in the queue. You can use it to send information to your visitors or just to give them peace of mind. Do they have their documents ready? What's the Wi-Fi password? Have they grabbed a cup of complementary coffee?